I can’t [blog] five words but that I change seven. 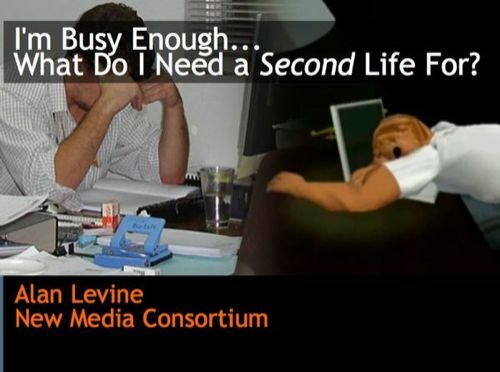 My first presentation today at the eLearning Guild conference was “I’m Busy Enough.. What do I Need a Second Life For?” a tact I took as I expected SL was rather outside the realm of focus for this conference. Well, that was not fully correct, as there was a fair amount of awareness here of virtual worlds and Second Life, but when I asked the audience of 50 or so how many had Sl accounts, there were maybe 5, 7 hands raised. A number of others let me know they were there because “it sounded nothing like the other sessions my employer told me to attend” or “we’ll never use it at work but I want to know what I am missing”.